One of the wonderful things about professional wrestling is that it constantly evolves. Every generation of performers is different, and what people do to each other in the pursuit of glory—or in this case, retribution—always increases in intensity. Impact Pro Wrestling (IPW) has featured many climactic encounters over the years. Whether it’s matches like No Rules, No Worries or Fans Bring the Weapons, the evolution of violent delights never ends. On May 20 though, there will be an end. And to bear witness to this final encounter between Liam Fury and Jason Burns, a 15-foot-high steel cage envelops the ring. When you’ve seen a lot of wrestling matches, it’s easy enough to become jaded. But that all melts away when you stare up at metres of steel. 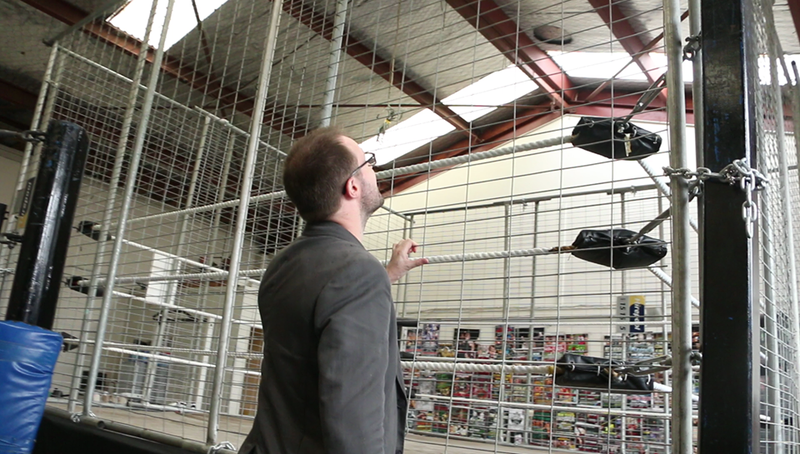 As the ring announcer for IPW, I had the opportunity to inspect the cage in advance of this historic match. I stood in front of it and felt unnerved, as Fury and Burns surely will. I stood inside it and felt suffocated. A steel cage is an unnatural, hostile environment. Unlike a lot of chicken wire fence cages, it’s not mesh that makes up the majority of the IPW cage, but instead thin steel bars. Gripping it briefly with my hands left red marks. And two men are going to fight in this thing? Two men who are looking for any method to maim each other? Being inside the steel didn’t agree with me, and I don’t think Fury and Burns can really prepare for how it’s going to feel when they’re inside. Their only way out is to finish the rivalry that has consumed them both for over 14 months. And whether only one man walks out of the cage, or neither of them, deep down they both know they need this. They need it to be over. And the cage isn’t going to let them leave until it is. May 20 is history in the making. It is the evolution of professional wrestling here in New Zealand and the end of the most personal rivalry we’ve seen in years. Liam Fury and Jason Burns will be caged like animals – and they’re going to treat each other like animals. Violent delights have violent ends, and this delight is impossible to miss. IPW Caged Fury, May 20, Mt Eden War Memorial Hall, from 7pm.